APC says to Senate - Nobody Can Stop Amaechi. ~ CK Jacob: Nigerian Fiction And Lifestyle Blog. APC says to Senate - Nobody Can Stop Amaechi. When The Nation spoke with the publicity secretary of the APC Mai Malla Buni, he said petitions do not translate into conviction saying that the APC will support the nominees irrespective of the petitions against them. Buni said: “On this ministerial screening, the party is behind all it's nominees.That is why the APC National Chairman, Chief John Odigie-Oyegun, and key members of the National Working Committee (NWC) have attended the screening of nominees to give them moral support.“As far as we are concerned, the petitions against some nominees cannot stop their screening because petitions are not court verdicts. The committee chairman, Senator Samuel Anyanwu, on October 20, told newsmen that the panel had concluded work on the case. The Senate has not yet fix the date for the screening of Amaechi which was earlier slated in today, October 20 but was reverted by the leadership of the Senate. In a related development, Amaechi media office had denied reports that the nominee reportedly stormed out of the residence of Senate president, Bukola Saraki last Thursday, October 15. Amaechi’s media statement read in part: “Our attention has been drawn to the lead report in a newspaper of today (Monday, October 19, 2015), where it was reported that Amaechi, the immediate past Governor of Rivers State “was incensed over the deferment of his screening last week and stormed Saraki’s house to register his protest. “The imagery created in the last four paragraphs of the lead report was an angry Amaechi who stormed the residence of Senate President Bukola Saraki, raised his voice as he made a scene or caused a “ruckus” to display his frustration over the deferment of his screening by the Senate, before “storming out in a huff”, without seeing the Senate President. “This is absolutely not true. 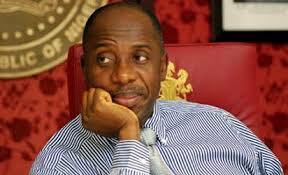 There is a deliberate and carefully calibrated attempt to characterize Amaechi with a very bad and demeaning mannerism. “We must clarify that Amaechi did not visit and was not at the residence of the Senate President on Thursday of last week. Since he did not go to the residence of the Senate President on Thursday of last week, so, there is absolutely no way what the newspaper sources claimed to have transpired, happened. “We must emphasis that Amaechi holds the office of the President of the Senate in very high esteem and will never disrespect or act in any way that would put the office in disrepute. However, in this case, the incident reported never occurred either on Thursday or any other day. “While we understand the constraints and pressures journalists face in doing their jobs, we would advise them to be thorough and double-check or even triple-check their sources of information. EPISODE 1 TITLE: Heaven Must Wait.